Having an iPhone stuck in headphone mode is frustrating. You can experience this issue when you're trying to play audio music, only to notice the iPhone isn't producing any sound. Also, the iPhone will display a headphone plugged in notification even when you disconnect your headphones. It can be also caused by different iOS system errors, and many Apple users are experiencing this iPhone stuck in headphone mode issue. This mode will mute smartphone operations such as calls, video chats, etc. Here we bring you more information about it; let's continue. 1. Disconnecting the speakers or headphones quickly. 2. Using incompatible headphone brands. 3. Connecting low-quality headphones on an iPhone device. 4. Disconnecting speakers or headphone when the phone is busy. 5. Moisture or water damage on the headphone jack port. 6. The headphone jack stuck with dust or lint. 7. There is a software error caused by iOS update and incorrect operation for headphone. When your smartphone stuck on headphone mode, you can implement different techniques to correct this error. These methods are simple and straightforward. Restarting your device is one of the excellent and straightforward means to fix iPhone headphone mode problem. This solution helps in resolving software-related issues on the smartphone. 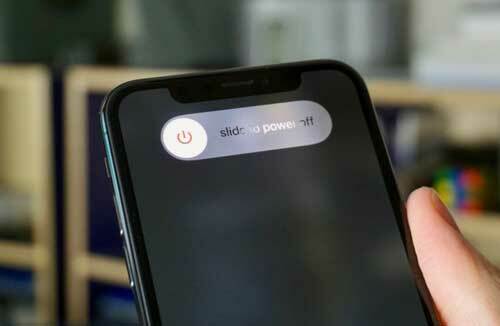 You just have to press and hold iPhone's power button until the screen displays the Power option. Drag it to switch off the device. Then wait for several seconds and turn on the phone. This activity will solve the iPhone headphone issues without much effect. 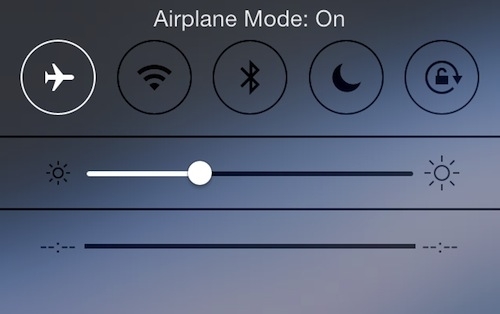 Step 3: Wait for several seconds, and click the Airplane mode symbol again. 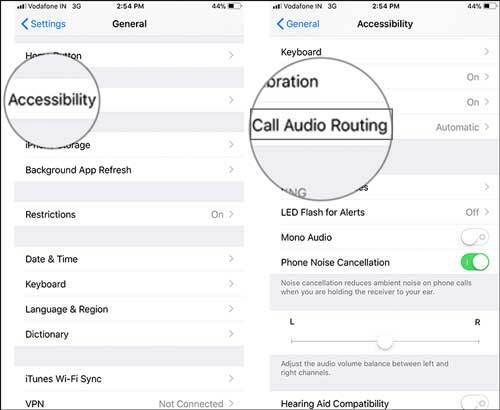 This will disable the headphone mode on the iPhone. 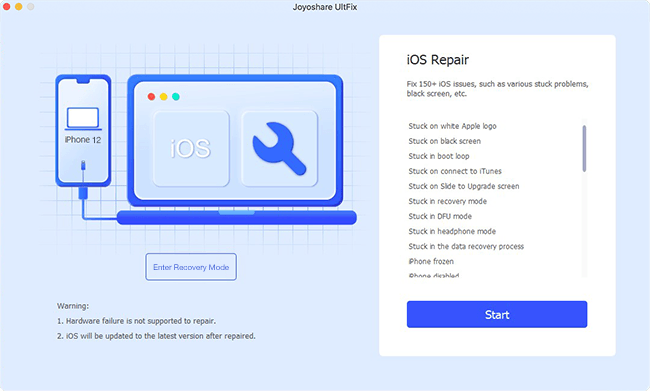 It is assured that you prefer to use a surefire solution to repair an iOS system issue, such as iPhone stuck in headphone mode, recovery mode or DFU mode, iPhone won't restore, update or turn on, iPhone white screen, activation error, iPhone is disabled connect to iTunes, etc. 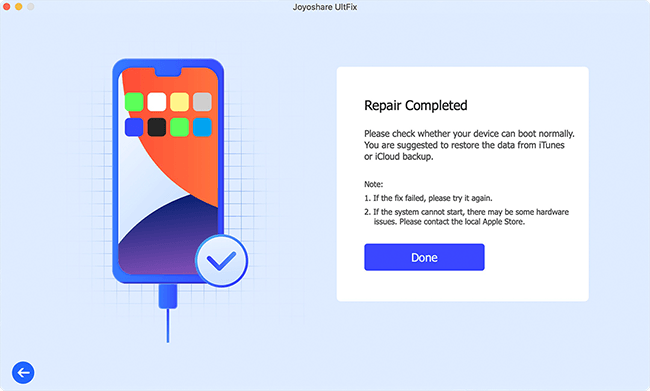 Luckily, Joyoshare UltFix iOS System Recovery is such a professional iOS repair tool designed to fix iPhone, iPad or iPod touch to normal status with no data loss. With it, one free option, quickly entering/exiting recovery mode, is offered to delight you. Furthermore, it's available to restore iPhone to factory settings with no passcode or iTunes. Step 1: Run this program on your computer and get ready to connect iPhone with one original Apple cable. Then press on the "Start" button to next step. Step 2: You have to select one repair mode based on your own needs. 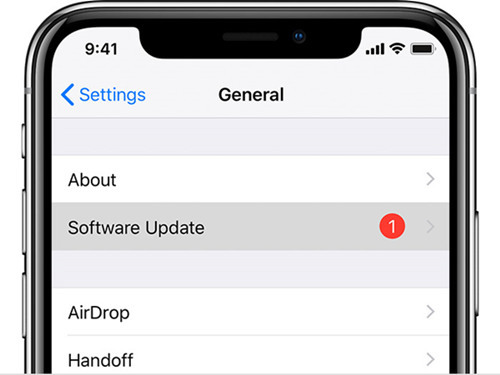 "Standard Mode" refers to a process to fix iOS problems with no data loss while "Advanced Mode" allows to factory reset iDevice or unlock screen without passcode. Next you can click "Next" button to put iPhone to DFU or recovery mode. 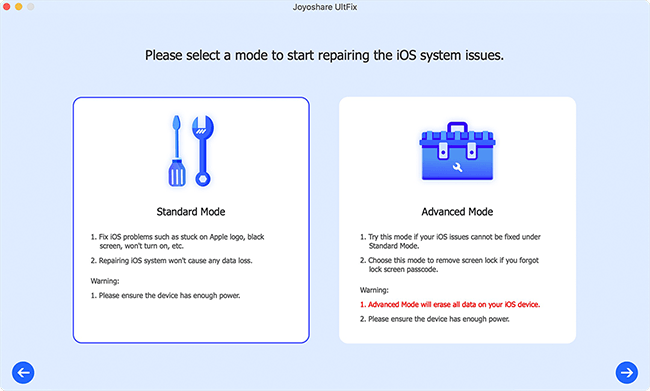 Step 3: Joyoshare will detect and show your iPhone device info. Confirm it and then tap on "Download" to download and verify the firmware package. Step 4: Click the "Repair" button to unzip the firmware and let this program help fix iPhone stuck on headphone mode. Try to plug in and out the headphone for at least 7 to 10 times. This method is useful in fixing the headphone mode issue when the iOS system fails to recognize the unplugging of the headphone. Double tap the device's Home button and ensure that no background applications are running. You should then unplug your headphone, and the headphone notification on the screen will disappear. Step 4: On the menu, tap an icon that allows you to transfer audio files to your device's built-in speaker. This will solve the headphone mode stuck issue. Step 2: If you identify any lint, blow the port several times with a cotton cloth or cotton bud. Also, you can use the compressed air to blow out the debris. However, you should ensure not to apply water on the jack port. 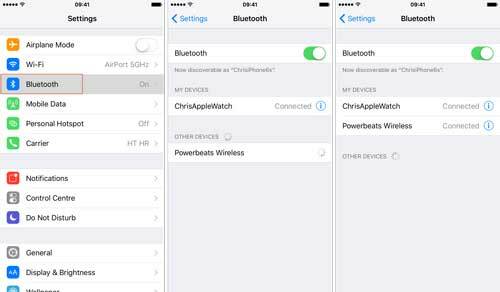 If you get stuck in the iPhone headphone mode, you can solve the issues by using Bluetooth speakers or headphones. When you open a Bluetooth connection, the smartphone will detect these devices. It also detects when you terminate the Bluetooth network. All you need to do is to connect your smartphone to any Bluetooth audio output for about 15 minutes. Terminate the connection to determine whether iPhone headphone stuck mode has been fixed. The headphone jack is the most vulnerable part of a smartphone. It can get damages without you noticing. When you're listening to music, sweat can run down to the pot causing damages. Also, when you put your iPhone in the pocket, high humidity can occur affecting the jack port. 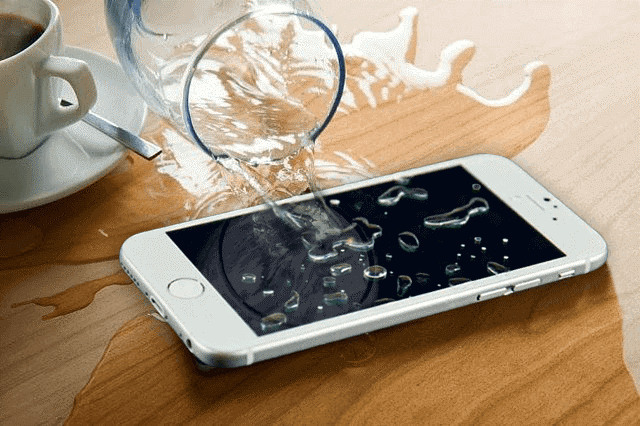 One of the excellent methods to solve water damage on iPhone is by placing the device on silica gel. Also, you can cover the smartphone with uncooked rice to absorb the water. After a few hours, plug in a pair of headphones and then unplug it to determine if it fixes the iPhone issues. Also, ensure you use high-quality headphones because iOS devices may fail to recognize some headphone brands. Another good option to get iPhone out of headphone mode is through Hard Reset. It's similar to restart your iPhone; only that it clears unwanted garbage memory from your device. The process is safe because it doesn't cause data loss. Here are the guidelines to follow. If you're an iPhone 6 user, press and hold devices' power button together with Home button. Hold tight the phone for about 20 seconds until an Apple logo appears. For iPhone7 and 7 Plus users, press the Power and Volume Down button together. Wait for around 20 seconds, and when the Apple logo appears, release the controls. 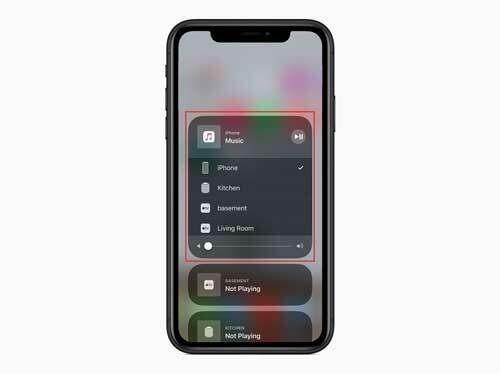 For iPhone 8 and later, press and release Volume Up button and Volume Down button quickly, one after the other. Then press the smartphone's Power button in iPhone 8, and Side button in iPhone X. Once the Apple logo displays on the screen, you can go to examine whether the speakers of the smartphone are working. 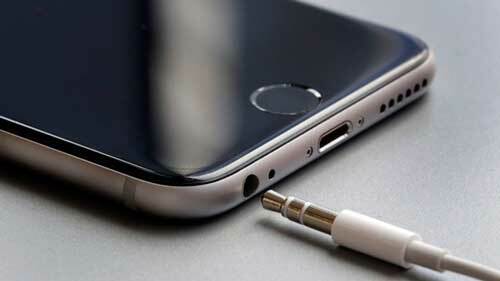 Updating your iOS system will fix iPhone stuck in headphone mode. It also prevents many software-related problems from occurring in the future. Step 3: Tap on "Software Update" and the device will start searching for updates. The process may take several seconds. Step 3: If the device is in Automatic, switch to the "Speaker" option. 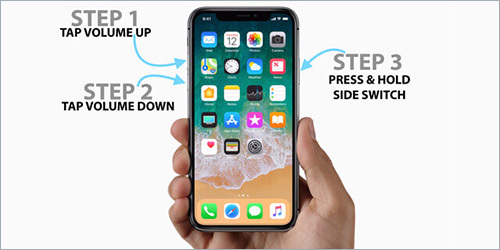 If you're encountering with iPhone stuck on headphone mode trouble, you can use any of the above solutions to resolve the problem. All these methods are efficient and will solve this iPhone error faster. They are do-it-yourself procedures, and you don't need to contact Apple support for assistance urgently. Do it right away so that you can better enjoy your iPhone. iPhone Stuck in Recovery Mode? Fixed!